Gaming headsets are very much in vogue. Gone are the days where we were satisfied with the tinny, garbage mics and earbuds packed in with our consoles (or available at bodegas for $5 or less); these days, sounding like you’re being piped through one of those plastic throwaways is the fast lane to mute town. 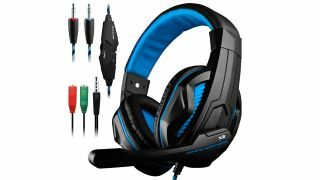 Anyone who plays multiplayer games that lean heavily into team comms, or more generally just wants to get more fully immersed in the games they play, is in the market for a great headset (some of the best of which we highlight in our best PC headset for gaming guide). A good gaming headset isn’t just about a decent quality boom mic so you can chat with your friends while you play the best PC games or the best PS4 games. Some of the finest also come with great features like noise cancelling, or positional audio to improve your situational awareness (particularly useful in shooters and battle royales, where hearing footsteps is often the prelude to ambush). And a proper headset can also serve you well when you want to watch movies or listen to music with high quality audio but don’t necessarily want to broadcast the sound. There a ton of manufacturers making a dizzying plethora of headsets these days though, so if you’re shopping for one, where do you start? Read more: Razer Kraken Tournament Edition review: "A fantastically versatile gaming headset"
The first step is determining whether you’re looking for a headset or more traditional headphones. Headphones generally focus more exclusively on sound quality, on the balance between highs, mids, and lows. Good studio grade headphones will generally be more expensive than a headset and if you want mic functionality, you’ll have to buy one separately. But if your primary focus is amazing sound, headphones are definitely the way to go. On the other hand, if you’re looking to save money, and prefer the convenience of a built in boom mic, a headset is for you. And some of the best gaming headsets provide incredible sound quality that only the most discerning audiophiles will nitpick. Plus, the money you save on your headset means potentially more games to actually make use of them. Which headset is for you? Next, you need to settle on a budget, what you’re comfortable spending to up your aural game. Headsets are generally less expensive that high-end headphones, but you can still spend a tremendous amount of money on them if you’re so inclined. Figure out what level of luxury you want/can afford and start exploring headsets that fit into that range. You also need to figure out which features are musts for you. First, you’ll need to match your headset to your setup - for PC, you can probably get away with a wired set, particularly if you game at a desk or close to your machine. But if you’re primarily playing on console, or you pipe your PC into your TV while you lounge on the couch, you’ll need a wireless set or, at the very least, a very long connection cable. If you use teamspeak a lot, you’ll want to prioritize an excellent mic with high levels of clarity and fidelity, one that’s not omnidirectional and that includes noise cancelling functionality so your teammates only hear you, and not your environment. If it’s at all possible, try to find a kiosk that sells headsets, or a display at a brick and mortar store near you where you can try before you buy. One of the most important attributes of a headset is how comfy it is when actually perched on your dome; if it feels constrictive or crushes your ears in an uncomfortable way, it doesn’t matter how crystal clear the sound is or how pretty the RGB lighting, it’s going to feel like you’ve squandered your cash. Find something that you know will be cozy to wear over long sessions; if you can’t try one on in person, look for adjustability features on the band, or earphones that come in different sizes to suit your own ears. Also, decide if you want closed earphones that provide greater privacy and effectively mute any sound playing through the headphones, or open earphones that may leak some audio but will be generally cooler. If you’re able to test headsets in person, look carefully at the build quality and materials of the headset. Cheap plastic parts, thin cables, or attachment points that look flimsy are likely to wear down or break with use, and the last thing you want is to drop a bunch of cash on a headset that’s virtually unusable after a few months. Look for something solidly constructed and durable, with sturdy cables and soft, high quality earphones. Also, if you’re able to, test the earphones with a couple types of audio; music, games, movies, whatever’s available. Performance can differ pretty drastically depending on the type of audio you’re piping into the headset, so try to experiment with anything you might actually listen to on them with any frequency, with variance in treble and bass, music and speech. Finally, look for something that fits your style, something that you won’t be embarrassed to have sitting on your desk or coffee table. There’s a wide range of looks available now, from modern, sleek, and understated in chrome or black, to flashy arrays of RGB lighting in millions of pulsing colors or garish logos picked out in neon rainbows. Pick whatever suits your personal aesthetic and will look good with the rest of your setup. If you’re looking for a quick pick for one of the best headsets currently available, you can’t go wrong with Turtle Beach’s Elite Pro tournament set. They’re hands down one of the best gaming headsets available - fantastic sound quality paired with a great, ultra clear mic. They also feature some welcome tension settings for both the headband and the earphones, making them one of the most comfortable adjustable headsets on the market. And at around $200, they’re not exorbitantly priced, either. On the other hand, if you need a great, inexpensive wireless headset, Razer’s ManO’War is a fantastic choice. They’re light, comfy, and provide high quality sound, and they pack a bunch of controls on the side of the set itself, so you’re not fumbling around with software or a keyboard and mouse while you play. They also tuck the Bluetooth dongle inside the headset, a handy little convenience, and if you’re using them on PC you get glorious 7.1 surround sound by way of Razer’s Synapse app.